?How often should I replace my running shoes? For some people, sitting still is tough. They want to be active, whether that’s playing sports, going for a run, hitting a rock wall, or something similar. Being forced to sit on the sidelines to deal with foot pain or an injury is one of the most difficult things for them to do. If this sounds like you, you might be tempted to “push through the pain” so you can still be active. The good news is you can try alternate activities for injured feet to still be active while allowing your lower limbs to heal. Foot pain and injuries do require rest, but that doesn’t mean doing nothing at all. Alternate activities that don’t strain your lower limbs or aggravate your pain can help you stay active and in shape. This can be helpful whether you’re an athlete who doesn’t want to lose strength and conditioning, or just someone who hates to sit still. Water aerobics – This cardio workout uses your whole body, but the added buoyancy of the water keeps pressure off your lower limbs. 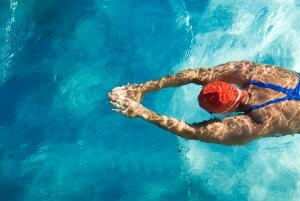 Swimming – Another cardio and full-body workout, doing laps in a pool may be a good option. Biking – Depending on your type of foot pain, your feet may be able to handle the low-impact strain of biking. Rowing machines – This workout engages your upper body without putting too much pressure on your feet. Weight lifting – Weight lifting, especially with machines, is another good option that doesn’t require your feet. Finding what works best for you while you treat your foot pain can take time and experimenting, but it’s worth your while. With many options to keep you busy, there’s no reason to feel like you have to sit still, even when your feet hurt! Our team at Absolute Foot Care Specialists is dedicated to helping you take care of your feet and stay active. If you’re struggling with foot pain, don’t let fears of losing your favorite activities keep you from getting care. We’ll help you both treat the problem and discuss alternate activities that are foot injury safe. Contact our Las Vegas offices today for more information or a consultation. You can reach us online or by calling (702) 839-2010.